European space ministers are slated to decide next month whether to develop a German-led robotic lunar lander, a mission which could be launched in 2018 at a cost of $650 million, according to a study released Tuesday. 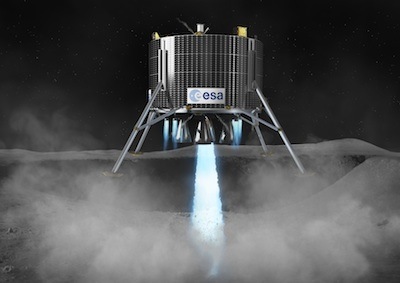 The lunar lander project, long favored by Germany, is part of a package of missions the European Space Agency is proposing to its member states at a ministerial council meeting in November in Caserta, Italy. Scheduled for launch in 2018 on a Soyuz rocket from Europe's spaceport in French Guiana, the lunar lander would settle to a rocket-assisted touchdown near the moon's south pole some time in 2019 for a six-month surface mission. In advance of November's council gathering, ESA signed an $8.4 million contract with EADS Astrium in September 2010 to continue designing the lander and present a cost estimate for the mission. The Astrium study confirmed the total cost of the lunar mission at about 500 million euros, or $650 million, including technology validation work. The development, construction, testing, launch, and operations of the spacecraft would cost between 300 million and 350 million euros, or $390 million to $454 million, Astrium said in a press release Tuesday. Germany is currently joined on the lunar project by Spain, Canada, Belgium, Portugal, and the Czech Republic. Officials hope to broaden financial support to more countries at the ministerial meeting next month, but indebted European nations could balk at the proposal. If Germany and its partners offer enough funding, the lunar lander will continue to a preliminary design review in early 2015. November's ministerial conference will also decide on Europe's future launcher, the ExoMars mission to the red planet, ESA's contribution to NASA's Orion crew capsule, and International Space Station utilization, among other agenda items. The lunar lander's main goal is to demonstrate Europe's ability to land a robot safely on the moon and evaluate conditions for future human exploration, including the search for resources like water, which could be used by astronauts. The spacecraft would launch into a high-altitude elliptical orbit before being captured by the moon's gravity into a 60-mile-high orbit, where it would survey the south pole region for suitable landing sites. The lander would drop from orbit and make a rocket-assisted touchdown in 2019, using autonomous optical and laser-based guidance systems to find a safe, level landing zone free of boulders. ESA says the solar-powered probe will have a landing accuracy of several hundred meters. With its landing legs deployed, the vehicle will stand more than 11 feet tall on the moon. Astrium says its experience with the Automated Transfer Vehicle - the largest resupply craft servicing the International Space Station - will be a cornerstone to the lunar lander mission. Propulsion and navigation components derived from the ATV program are slated to fly on the lunar lander. Rocket thrusters used on the ATV were test-fired in Germany to check their ability to control the lunar lander's attitude during descent to the moon. 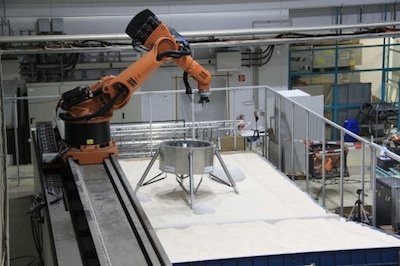 Navigation and terrain testbeds at the German space agency's Institute of Space Systems in Bremen hosted tests of guidance technologies and landing legs in a realistic simulated lunar landscape, according to Astrium. "As a demonstration of technology, the ATV mission proves the skills and experience which Astrium has in automated rendezvous and docking procedures," said Michael Menking, Astrium's senior vice president of orbital systems and exploration. "This study's concept is based on ATV technology, and our unique expertise will enable us to develop the key technologies essential to landing an automated vehicle on the moon."